My Winter 2018 Capsule Wardrobe| How To and Video! Having a capsule wardrobe is something that I've aspired to have for a couple years now. 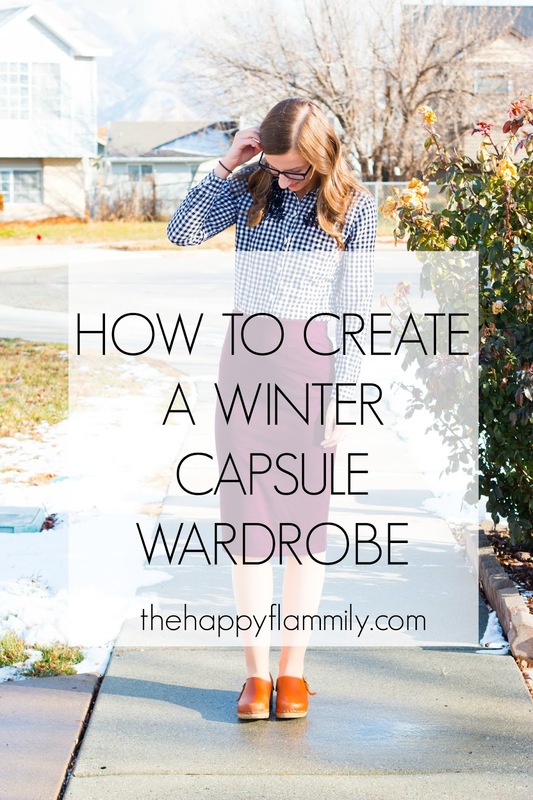 For those unfamiliar, a capsule wardrobe is where you only own 30 pieces of clothing per season. This includes tops, bottoms, shoes, coats, and accessories. Some items can be worn in multiple seasons, and for me, this wardrobe is mostly fall/winter, and my next one will likely be spring/summer, so not really four separate wardrobes. In this post I'm going to outline how to actually get started with doing something like this, and I'll also show you my process in a video at the bottom! Step One, Clean Out Your Closet: In this step, go through your closet and get rid of everything that you know you haven't touched in ages. If you know you don't love it on you, it doesn't fit, there is a stain, or a rip, put it in the garbage bag and don't look back. There were so many pieces that I found myself hanging onto simply because they were "on trend", but I didn't feel comfortable and confident in them, so I finally let go of them and cleared the space. Step Two, Assess What You Have: By the time I was done, I had 19 pieces of clothing left in my closet. A handful of shirts that I knew I wore all the time, a few pairs of shoes, two pairs of jeans, and a couple outfits for church. At this point I knew that when I went shopping, I needed to fill in the gaps with a few more shirts, a couple skirts, and a new coat and winter boots to get me through my first Utah winter in 5 years. Step Three, Browse For A Color Scheme: This is the part that I've always had trouble with in the past. The purging and repurchasing has never been the problem, but getting everything to a point where it blended together well was the major issue. When I looked at what I already had in my closet, I could see I had a lot of neutrals like grey, navy, burgundy, and cream. I then went onto Pinterest and searched for "Fall Capsule Wardrobe", and found this and this capsule wardrobe that really spoke to my own personal style. I used this for a guide in my shopping, and it worked so well. When I needed to buy something, I'd look at those capsule wardrobes and think, "Okay, I don't have a red plaid shirt, so I'll go look for that!" Step Four, Start Shopping: A lot of people I feel like use capsule wardrobes as a way to have a small amount of designer clothes that all work well together, and last them for years and years. This probably is the ultimate goal for me too, but this time around since I was still adding 10+ pieces into my closet, I stuck with my typical stores like Target, Old Navy, and Forever 21 so that I wouldn't break the bank. While looking at my "capsule maps" that I found on Pinterest, I shopped until I felt like all my gaps in my clothing were complete. Next fall, I'm hoping that I won't have to purge nearly as many clothes, and then on the items that I do replace, I can hopefully invest in higher quality pieces that will continue to last me season after season. Step Five, Assemble Outfits: Because all of my pieces fit into a certain color scheme, so many pieces work well with different items. I can wear my red plaid shirt with my rain boots, and black and white vest, or I can wear it with ankle boots and a cardigan. I can wear my black and white gingham with jeans, ankle boots, and a sweater, or I can wear it to church tucked into my burgundy pencil skirt paired with my brown clogs. That's the benefit to having a cohesive wardrobe, you can make countless different looks because your closet is working for you instead of against you. 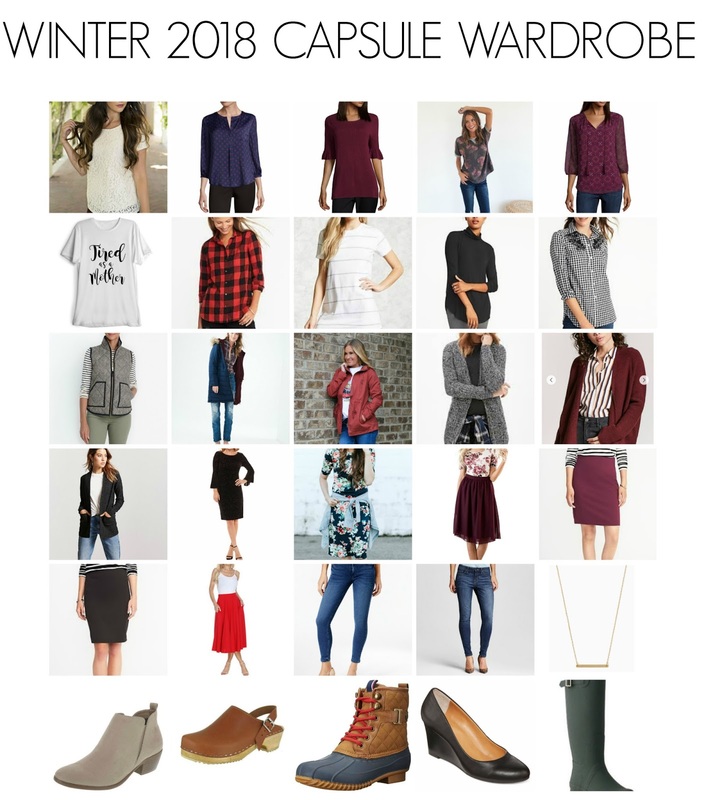 The picture below shows all of the items in my capsule wardrobe for the winter, with links underneath to purchase anything that inspires you. A few notes though: to reiterate, 19 of these items I already owned. I've linked you to the same or similar versions of things that I already own. I will share how to style these outfits in separate posts over the next few months, and everything is less than $60, but mostly in the $15-40 range. Absolutely love the pieces you pulled together! I want to streamline my wardrobe a little more and this is so helpful. Thanks!